I had a surplus of extra lean ground chicken in my fridge this weekend and knew I needed to cook some of it up today (along with the roast which is already in my slow-cooker). I could make burgers for lunch, but then, I hadn’t had breakfast yet. Canada Day without breakfast?! How about brunch? Even better! By noon, I had whipped up two pounds of this ground chicken into 18 chicken sausage patties based on Sophy’s Chicken Maple Sausage Patties #1 recipe on Spark Recipes. My version is very similar, but I made a few adjustments based on what I had on hand and dietary needs. Three tablespoons of maple syrup bumped up the sugar content a bit more than I wanted, so I cut back, for example, and still found that we could taste the maple-y sweetness in them. We’re also not fans of cayenne, so I omitted that and the coriander because I didn’t have any on hand. But what a special way to celebrate Canada Day, imo! In a small bowl, mix all the dry seasonings together. In a large bowl, mix by hand all the dry seasonings, meat and syrup. This is messy, so you might want to run your hands under water before working with the meat and have your soap on hand for washing up quickly! Use an ice cream scoop to separate the meat evenly into 18 balls of sausage. Set these in twos or threes on wax paper, cover with more wax paper and then press down lightly with a flat plate. Be careful not to make them too thin or you’ll have trouble separating the meat from the wax paper later. I also sprayed the paper with non-stick spray but if left too long, it made the paper soggy and it would tear when trying to peel the patties off. I may consider using foil that is sprayed with non-stick spray next time and see how that works. Once you have flattened three, heat a skillet over medium-low heat and place the first three on the skillet. Cook for 3-5 minutes on each side, depending on thickness, checking periodically to make sure it doesn’t burn. (The maple syrup content might cause some real darkening issues, so keep an eye on it.) Between sausage-cooking, make up the next three patties and repeat the process. You may need to quickly wipe the skillet down between batches to remove any dark caramelized bits off the skillet (these can get a bit bitter, though some people might like them). Serve on their own, with eggs or on breakfast sandwiches. 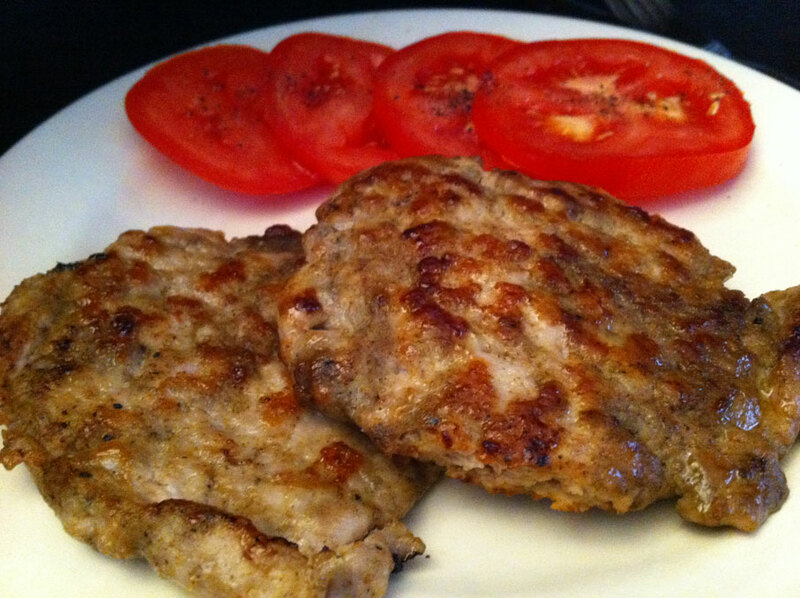 This entry was posted in altered recipes, Breakfast, Brunch, Carb-friendly foods, comfort food, lower sodium, Lunch, nutritional values, recipe, review and tagged black pepper, celery salt, garlic powder, ground allspice, ground chicken, ground sage, ground thyme, maple syrup, onion powder, paprika, salt, sausage patties. Bookmark the permalink.